“Was at Varthur Kodi now. It is stinking. Foam overflowing today even late evening. Conditions worsening. Rain has started and this foam may fly into faces. In contrast, half the streetlights in the vicinity of Varthur Kodi are off. 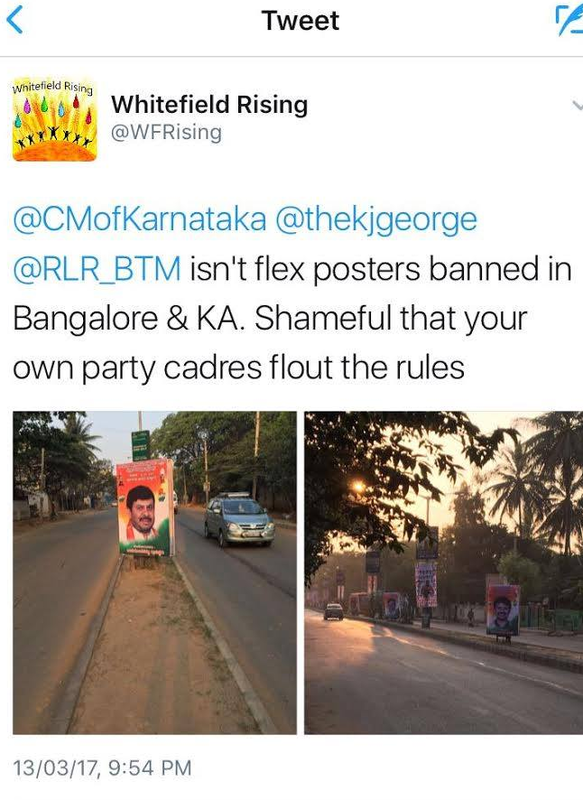 And to mock citizens, the ruling party has put huge cutouts and flexes all along Whitefield Main Road. This photo was taken around 9 a.m. on 13 March 2017. When I checked at Varthur Kodi at 9 p.m., the condition was similar. Varthur Lake is frothing and fuming at the powers that be like never before”. Section 1(i) of the Karnataka Open Places (Prevention of Disfigurement) Act, 1981 applies to all the city corporations constituted under the Karnataka Municipal Corporations Act. Suggestions Welcome on what WE can do ?